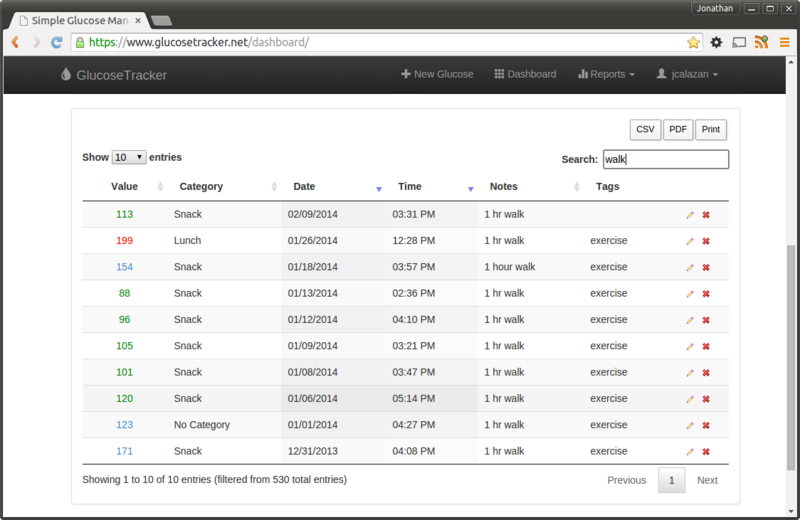 GlucoseTracker already has a page to do advanced filtering, but sometimes you just want to be able to do a quick search against some fields in your data, such as your notes or tags. Maybe you were wondering about how much a bowl of rice affected your blood sugar in the past, or see what your typical blood sugar level is after exercising. I'm happy to announce that it's now possible to do just that directly from your dashboard! You should now see an extra 'Search:' field in the glucose table where you can type in your search query and instantly see the results. This instant search feature will search the 'Value', 'Category', 'Notes', and 'Tags' fields.